Colonial rulers have left their mark in Gujarat. Surat in Gujarat was the oldest commercial Indian outpost for the British East India Company. The Dutch, Armenian and English cemeteries in Surat are reminiscent of colonial era when European settlers come on Gujarat's shore to do trade from the 1600's. There was a cut-to-cut competition amongst the European colonist to impress upon the natives their importance and for this they set up different mausoleums. The structure of some mausoleums is large and ornamented in Islamic style rather than a simple tombstone found in Europe. In the 16th century, Portuguese ran their commercial empire in Gujarat. Architecture created by Portuguese during their rule in Diu are known as the Portuguese colonial architecture. All the major buildings of Portugal like the house of Governer, costume house, churches, and forts are built in Portuguese style. The conspicuous broad outer domain and open spaces suggest a European style; the house of Banias', Paris' and Vohras' all shows these features. 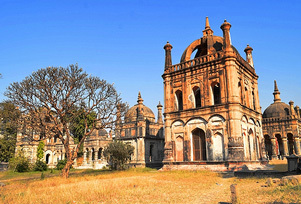 The bazaar, churches, bungalows and forts of Diu are the Portuguese imprints in Indian history.